Top 7 Best Juicer Reviews and Comparisons: Why Every Home Needs One!? At Juicer Fanatics, we provide the ​best juicer reviews and product comparisons to help you make the right choice for your needs! Whether you're looking for a centrifugal or masticating juicer, we have all the information you need! Our reviews include an easy-to-read format with pros and cons, features, and best suited for sections! We also have general articles and tips for using your juicer to get the most out of it every time! Lastly, we like to break down the best juicers of the year and give you quick links to buy the juicer you want to have in your home! There's nothing better than having fresh juice prepared from the comfort of your home. Not only is it better for you and your family, but it also tastes better than store-bought alternatives! You have more control over what goes in your juice, making sure it tastes just how you want with all the benefits of the fruits and vegetables! To get started with a juicer that suits your needs, check out the table below. We cover the type of juicer, it's main selling feature, the warranty information, our rating, and the price range it falls into! You can also click on the links below to see a more in-depth review of each of the juicers! Take a look and sort through this table of the top juicers. Click through for awesome juicer reviews and more information. You want a juicer that is a breeze to assemble, disassemble and clean. If your juicer is made up of too many parts that it is a headache to put together, chances are that you would not relish the thought of juicing. Consequently, your juicer may end up relegated to some dusty corner. Here’s the catch: while you may want a juicer that is made up of only a few parts, be aware that such simplicity also means fewer functions. Generally, the more parts a juicer has, the more functionalities it is capable of. For example, multitasking masticating juicers also double up as pasta-making and butter-churning machines. However, if juicing is all you want your juicer to do, it is best to go for the simpler ones. With regards to speed, you may be tempted to go for the faster ones but you must realize that you may be sacrificing nutrition for speed. For in general, slow-moving juicers produce juice that is of higher quality and quantity and has a better shelf life. This means that over time, you may be spending more on produce than you would if you only invested in the more efficient juicers. Also, the more expensive juicers generally of higher quality last longer and require fewer maintenance expenses. If you think the noise level of a juicer is not important, think again. Surely you do not want your morning juicing to wake up the rest of the family or worse, your neighbors. You would want a juicer that works quietly so as to keep the peace in your home. In general, the cheaper, high-speed centrifugal juicers are the noisiest while the slow-moving masticating and triturating ones are the quietest. You can keep the conversation going, watch and listen to your TV show and let the baby sleep on while you’re doing juicing. You certainly do not want your juicer to be too bulky as to stick out from your shelf and take up too much kitchen counter space. On the other hand, you don’t want it to be too small to fit in more than your desired volume of produce. The size you pick should be determined by how much volume of juice you need and how much storage space you are willing to give it in your kitchen. It is imperative that your juicer comes with a warranty to cover for unfortunate factory defects that may not be evident at the outset. Lack of warranty is oftentimes associated with cheaper brands and models of juicers. Can your juicer handle them all? When it comes to extracting the juice of highly-fibrous leafy greens such as wheat-grass and spinach, only the more powerful juicers can do the job. In general, a minimum of 400 watts is needed for extracting the juicy goodness of tough vegetables. Of course higher power may mean costlier electricity bills but if you want to save on produce in the long run or have better-quality juice, you may not mind the spikes in your bills. Generally, the more functions a juicer is capable of, the more parts it contains and consequently, the more challenging it is to clean. On the other hand, simpler models of juicers consist of only 5 to 7 parts, making clean-up fairly straightforward. Ask yourself what functions are most important to you in a juicer. If you want more than a juicer and would like to make pasta with it, go for the more complicated to juicers even if they are a challenge to clean. Centrifugal juicers are probably the most common juicers. This type of juicer extracts juice by means of a metal blade which spins at high speeds against a mesh filter. Centrifugal force is what brings about the separation of the juice from the flesh. While these conventional juicers are fairly efficient at churning out fresh fruit juices, they do present a drawback when it comes to juicing leafy greens such as wheatgrass and kale. Incidentally, if you are a purist juicer, leafy greens are your best friends and you may not like the fact that centrifugal juicers are not quite up to the task of juicing greens. you can pick up a great quality centrifugal juicer for a lot less than a quality masticating juicer. The very high models, however, are comparable in price. if you’re looking for juice in a hurry, centrifugal juicers are your saving grace. The high RPMs mean your juicing times are considerably shorter. since these juicing machines are easy to disassemble, they are also easy to clean juicers. The newer models are dishwasher safe also, meaning tedious cleanups are a thing of the past. Cant juice leafy greens as mentioned above, due to the nature of these juicers, you won’t be able to juice leafy greens such as wheat-grass of kale. Masticating juicers are also known as cold-press juicers as their juice extraction mechanism does not produce heat. These juicers initially crush before pressing fruits and vegetables. These juicers mimic the natural mastication or chewing mechanism of our oral cavities. The auger chews on fruits and vegetables at slower speeds than centrifugal juicers. This slow speed significantly reduces heat and foam generation while increasing the efficiency. Compared to centrifugal juicers, masticating juicers are much more efficient at extracting juice from highly-fibrous greens such as wheat-grass and other greens. The pulp comes out very dry and the yield is high. the way these juicers work allows for an end product with a longer shelf life. The cold press mechanism extracts juice which retains more of the nutrients and enzymes that are naturally present in whole fruits and vegetables. This makes masticating juicers the best choice for those who put a premium on nutrition. They are virtually noise-free so that you can juice without fear of rousing up anybody from sleep. You can juice while listening to the TV or talking with your kids. Masticating juicers are also extremely versatile as they generally come equipped with functionalities to homogenize food, enabling you to make baby foods for example, as well as make pates, butter, sauces, fruit sorbets and ice creams. There are even some masticating juicer models that can churn out pasta, breadsticks and rice cakes. 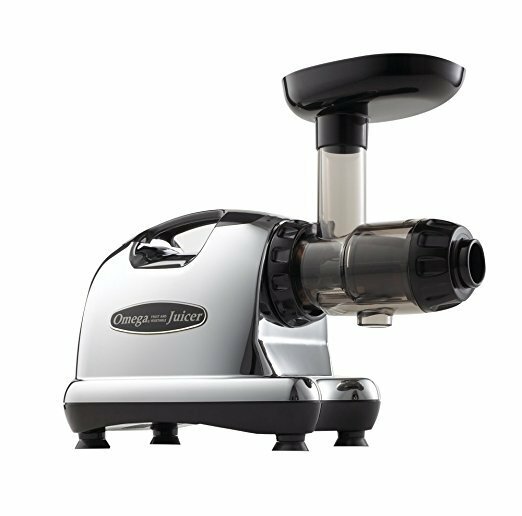 The price runs upwards of $200, with some going as far as the $500, for the top of the line masticating juicers. Avid enthusiasts of juicing know they easily recoup their investment in terms of superior quality juice which has a better shelf life. don’t get us wrong, the clean-up of newer masticating juicers is far from painful, but it does take longer than cleaning a centrifugal juicer, which is very easy to clean. Not great for time-poor individuals. These are short reviews of the best-rated juicers on the market. Click through or visit this page to see more in-depth, awesome juicing machine reviews. Not all of the top rated juicers have to be flashy, large, high-tech machines, do they? The Breville compact juice fountain (read our review here) is a compact, yet hardworking juicer, with a very attractive price tag. It may not have some of the features you’d find in the dearer models, but when it comes to juicing convenience and value, this juicer is hard to surpass. Ultimately, the right juicer for you is one which you want to use again and again – one which meets your demands and fits in with your lifestyle. Once you’re happy with your choice, read our guide on getting the most out of your new juicer. What works for some may not be enough for you while the ones you prefer may seem too complicated for others.